This post - is more of a compulsion. It has been a while I did not update my blog even after promising myself to do so. Recently one of my friend Amit reminded me that I have a blog and he would like to have it updated by me frequently. He himself runs a blog www.ultimateinversion.com posted some cool posts like Google Tricks and Lucid Chart Google Drive. I really don't have anything specific to share at this point but I decided to go ahead and post. 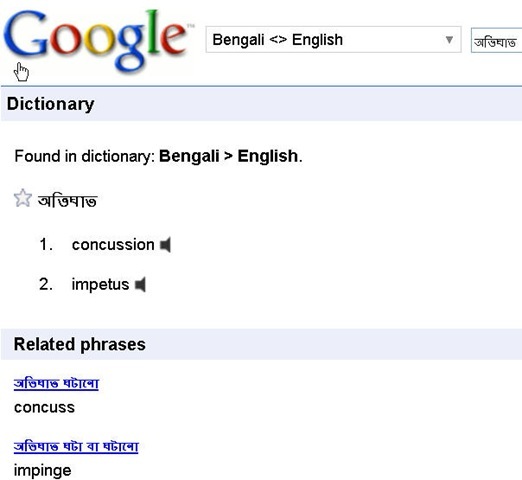 Hence its a kind of compulsion for me. I have been active in the social networking sites and micro-blogging sites lately and posting all interesting stuff that I come across there. I will probably put some of them here. Therefore this post is not only going to be random but also there would be some randomness among the sentences as well. I learned from my friend and writer Kunal - when you can't organize your text, just do bullets. And I am going to do so now. I discovered Shazam app not only recognizes any song that is playing within seconds but also it syncs the lyrics of the playing song. Its amazing. Now you can walk up to any bar and pretend to know all the lyrics of the song that is being played :) In fact it could highlight the talks during a concert show recording. What amazes me is that their are so many variants of the song and the matching window is so small that sometimes it is a part of multiple repeats, still it figures out the current block of lyrics and highlights. Lately I have been seeing a lot of my Facebook friends posting their travel photos in Facebook and look happiest of their all time in their lives. May be I am jealous ? But i personally don't like to post a lot of photos in Facebook , at least I would probably like to post it to very close friends or share by email. Anyway good for them but I came across this video . The bottom line is I don't really care about their family photos who are just acquaintance to me . Also therse days there has been a trend of posting restaurant food pictures on Facebook. What they are eating is never interesting to me. May be its just part of the expenses they are recovering by sharing the photos with everyone on Facebok. 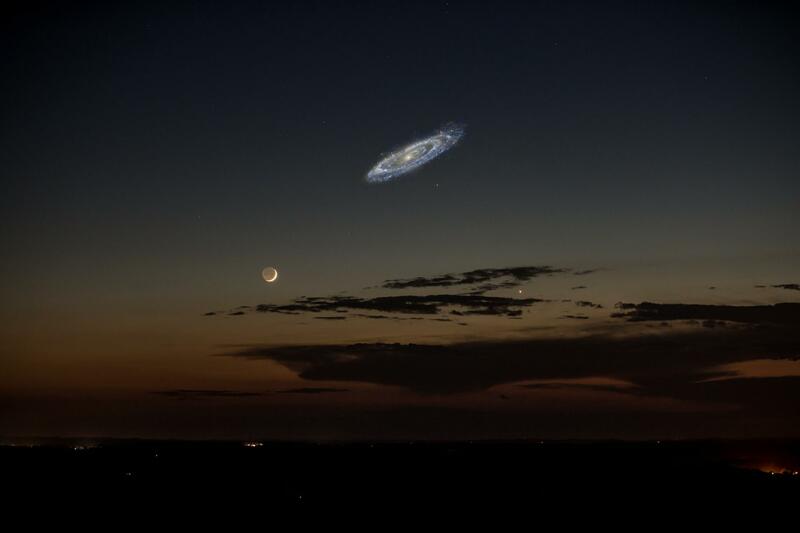 if Andromeda galaxy was brighter. Participated in Devthon where the city hackers got together to help Cyberabad Police in Hdyerabad . All thanks to Harish Krishnan and Prashant Venkatasubban for providing such an one of its kind platform , that was hard to imagine few years ago. 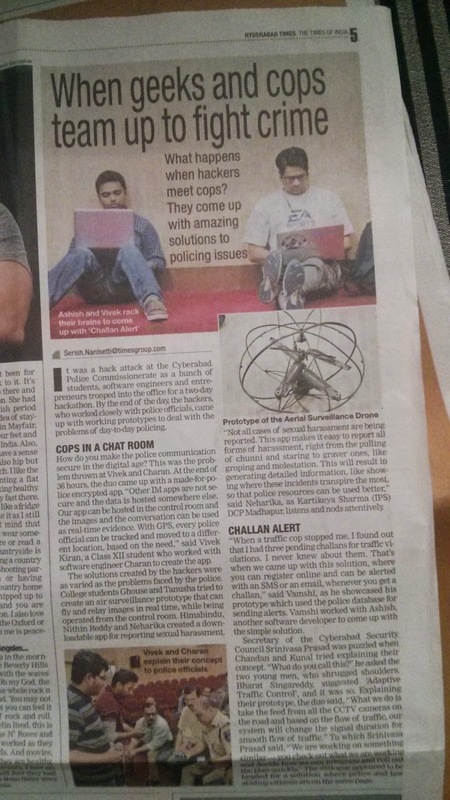 It was amazing to see how the Cyberabad police department came out to help us to help them to ultimately help us. Also I could see so many bright young engineers and product designers who would probably even reject offers from the Googles and Facebooks to do something on their own. Being raised in a police officer's family it was privilege to be involved with this and encourage you to subscribe to Devthon if this excites you. Awesome post dude, a good (re)start. Hope to see you post regularly and get informed on your recent hacks and discoveries !